Trees are the superheroes of the planet. Apart from being the most effective CO2 absorbers we have, trees help mitigate climate change, restart water cycles, stop deserts from spreading and turn barren grounds back into fertile woods and farmland. Trees help to empower women and lift people out of poverty. Our projects are helping to revitalise communities. Growing fresh produce in agroforestry systems provides food and income for those who need it most. Trees help to regenerate depleted soils, and allow people to thrive off their land rather than having to migrate in search of better living conditions. Local men and women can find stable employment and earn an income of their own, which can help to stabilize political and economic situations in developing countries. Thanks to this income, parents can afford to send their children to school, buy medicine and build houses. 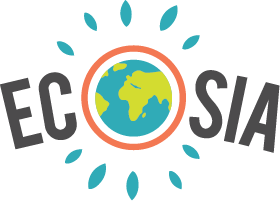 By planting trees with Ecosia, you can help to create and maintain a habitat for endangered animal species around the world to support biodiversity. Trees can also help shape and restore landscapes. With their strong roots, they can stabilize shorelines and mountain sides. Simply by planting a tree, you can fight climate change, restore landscapes, protect wildlife, provide nutrition, employment, education, medical assistance and economic stability. Mind-boggling, isn’t it? on our part, like the song...'making love out of nothing at all'.